Hexamail Guard receives emails and then delivers them to the correct recipients. If the email is for an external recipient, one not at one of your configured domains, Hexamail Guard will use your Smart Host settings to deliver the emails, or if no Smart Host is configured, it will attempt direct MX delivery to the final recipient's email server. If you have a Smart Host provided for you by your ISP, configure the host and port here. Use the Test Connection button to ensure you have the settings correct. If you have them setup correctly a success message will be shown, if not, the interface will return an error. 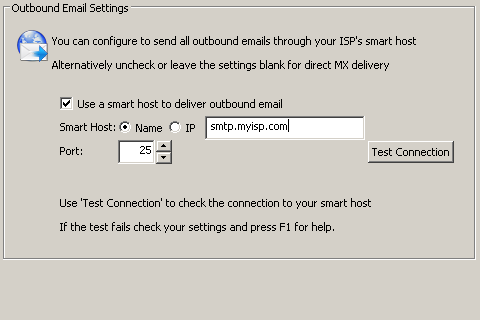 If the Test Connection button does not return a successful message Hexamail Guard will not be able to delivery outbound emails through your Smart Host, and they will be queued until your configuration is corrected or your Smart Host comes back online. If you do not configure a Smart Host, Hexamail Guard will deliver emails directly to the correct email servers. If you wish to use a smarthost to deliver email, enter your Smart Host name or IP Address and port (usually 25) into the appropriate boxes. A Smart Host is an email forwarding server, usually provided by your ISP for relay of outgoing emails from your organization. If your existing email server is setup to use a SmartHost, copy those settings into here, and adjust your existing email server settings to use Hexamail Guard as your Smart Host for outgoing email. If your existing email server is not setup to use a SmartHost, leave these settings blank, but be sure to set your email server to use Hexamail Guard as the smarthost for delivery of all emails in order that it can process outbound email. Use the Test Connection button to get Hexamail Guard to test a connection to your smarthost, verifying that the smarthost is accessible to Hexamail Guard and that the configuration is correct.